A Range of Development Opportunities exist for AJSC Players, Coaches, Officials and Supporters. This page has some general info and links on what is available year round as well as general programs. Individual events are emailed and advertised on Facebook. Club development are opportunities for skill for players, coaches, parents of AJSC and are provided free to the participants at various times through the playing session. 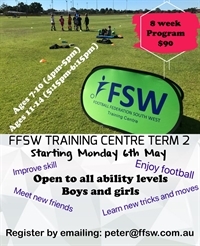 Football Federation South West - FFSW employ a regional development officer (Peter Dohnt) to manage and deliver player development programs to the clubs in the region. Peter's time is funded from a portion of your annual fees. Sessions will be on normal training nights and coaches may elect to replace or extend training to include these. Pro Football Training - PFT are a private supplier of football coaching and development operating in Perth and the South West. AJSC are fortunate enough with our fundraising efforts over the past years to be able to offer this additional club development. You will see PFT around the club most weeks at training nights running specific session or supporting coaches as well as on game days. There are currently 2 offerings in the region for player development. These are paid session and are opportunities for additional player development beyond the free club development during the season.